We all use the word ‘literally’ too much today. That shop didn’t literally rip you off, because you’re not a sticking plaster. You’re not literally in love with the artisan gin you tried at that festival, either. But when I say I’m literally on the edge of my seat when Dieter Wexler makes his final pit stop of the race with a podium finish hanging in the balance, I’m not using that word like Jamie Redknapp does. The tension really is so high that I edge almost completely off the chair, willing the tires onto his car like an automotive Akira. Related: the PC’s finest racing games. And that’s really saying something when you’re talking about a motorsport game in which you don’t get to drive the cars. 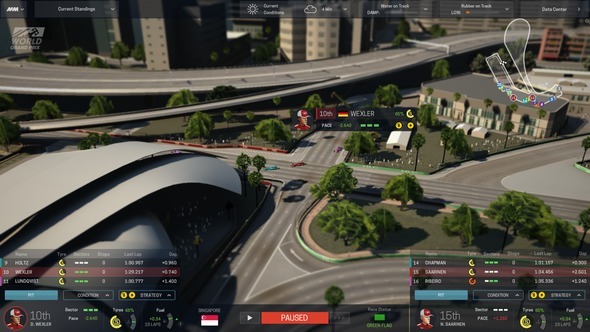 Motorsport Manager instead lets you do everything else required to win a formula one race: hiring and firing staff and drivers, developing facilities and cars, choosing race strategies, and shouting at drivers to hurry up/look after their tires/let each other through. It worked remarkably well as a mobile app when developer Christian West released it in 2015, and it fills out the extra space afforded by a graduation to PC effortlessly. It is, essentially, Football Manager for people who have strong opinions about parc fermé legislation, and are intimately familiar with Christian Horner’s jiggling leg. 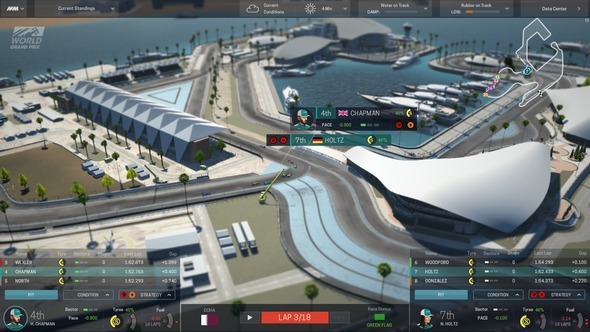 I’m using the reference point of F1 to describe it, and it is obviously a simulation of Bernie’s travelling circus that developers Playsport Games are shooting for in this game. It’s just that they’re doing it without official licenses. The cars look much the same as Hamilton’s and Vettel’s, but they’re not subject to the suffocating red tape that recognisable names and liveries would be. It’s hard to imagine the notoriously uptight Formula One Management being alright with drivers swapping from team to team at the player’s will, for example, or sponsors changing every few races. In any case, I’m bringing F1 and licensing up this early for two reasons. One: I’m the sort of gamer who really values official sports licensing, which means I think twice about playing unlicensed games (I know, I know). And two: I’m not worried about the lack of licensing in this game in the slightest. Partially because Playsport have built the game to be highly moddable, and in no small part because it turns out to be really very enjoyable pulling the strings in MM’s fictional sports ecosystem. It’s certainly more unpredictable. Male and female characters enjoy a roughly even split of the jobs inside and outside the car, which means the next dominant Lewis Hamilton-alike might very well be a teenage girl from China. An unfathomable prediction for the real sport, but eminently likely here. Mid-race refuelling is also a-ok in this vision of the sport, which allows a broader grid of tactical approaches. It all begins with a character creation screen. Without a second’s pause I begin making Fernando Alonso, approximating his iconic eyebrows and luxuriant hair as best I can from the preset hair and beard options and putting him in charge of Scuderia Rossini. He’s got unfinished business with the fan-favourite red team, I decide, and he’ll settle it from the pit wall. His career as a racing driver will mean he’s held in higher esteem by drivers and staff members, which adds a bit of an RPG trapping. If he’d come from a big business background, development costs would be dramatically lower on account of his friends in high places. With a team and manager in place, the start-of-season info hub is quite a lot to take in at first. 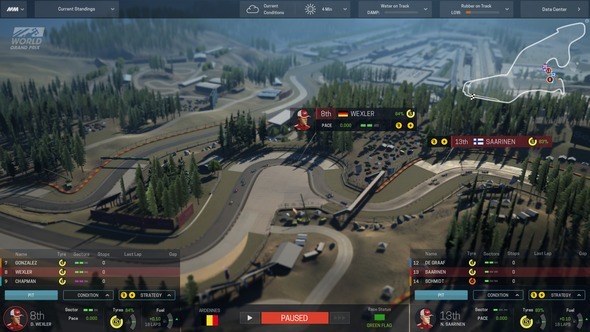 Imagine never having played a Football Manager game, and then trying to make sense of its myriad menus – the first five minutes with Motorsport Manager feel a bit like that. As I grow braver in my exploration of those menus though and realise I don’t actually have any pressing tasks it all feels a lot friendlier, and I set to work scouting young drivers for seasons to come. My veteran Finnish driver Niilo Saarinen is the wrong side of 35 now, after all. Race one creeps up on me while I’m still poring over the projected stats of teenage hopefuls. I haven’t done any car development, but I’m hoping the team I have in place for doing that have steered us in the right direction. They’ve at least brought a few new parts to stick on the car: a front wing upgrade and an engine tweak that I opt to install on both cars – the aforementioned veteran Finn would become unhappy with me if I started holding back the upgrades for Wexler. I do have my favourites on the team, though – Wexler’s undoubtedly a better driver. The choices I have to make in the name of equality throughout the weekend are more about managing relationships than maximising results, and that reflects some clever design on Playsport’s behalf to convey such a subtle aspect of motorsport in ostensibly simple mechanics and menus. Here’s the plan, just between you and me: it’s all about getting Wexler to the front. I send him out first in qualifying, giving him the most open tarmac while poor Saarinen’s deployed within a slightly narrower gap to punch in his hot laps. Unfortunately, my experience with the mobile app works against me here because I fail to notice that there’s a manual speed slider for each racer in qualifying now; currently both drivers are trundling round at minimum speed with ice-cold tires and brakes, having lost their optimal track positions. Bugger. Even Super Aguri were better at qualifying than this. With cold cars running amidst traffic, the Rossini pair manage times only worthy of grid positions in the late teens. It’s a disastrous result, and one only a masterstroke of strategy in the race can turn around. There’s plenty of scope in Motorsport Manager’s pre-race setup screens to craft such a strategy, but I’m not feeling bold on race day. I go again the grain of the tire choices reflected elsewhere on the grid – a grid full of super-soft compounds – by cladding the Rossinis in soft tires and decide to opt for a reactive approach – I’ll see how my drivers filter through the back-markers and order them to preserve tires and pit in based on what’s happening around them. That’ll do it. While that may or may not be the wisest strategy, it certainly proves to be the most suspenseful way to enjoy a race in Motorsport Manager. Races are anarchic, ever-evolving things subject to all kinds of tiny variables that redefine the ‘perfect’ strategy minute-by-minute. Weather conditions can change dramatically from one lap to the next, so there’s always an opportunity to gain ground by having your drivers on the right rubber. Similarly, it’s always very possible to chuck away a good result by failing to make the correct call in time. Then there’s the degradation rate of each dry tire compound, engine wear rate, fuel usage… yeah, really pay attention to that last one. I don’t. In the first few stints of the race I encourage both drivers to use their overtaking engine mode which burns fuel like nobody’s business. It helps them make their way through the slower cars after that disaster quali session, but it also means they need to do some engine management from the midway point in the race. Then it starts to rain. Remember when that used to be a source of real drama in F1? It’s just as impactful in Motorsport Manager. The first spots land on the track immediately after Dieter Wexler makes it back out of the pits having just swapped some burned out softs for fresh super-softs. This is, of course, an absolute disaster. I do manage to react quickly when it comes to Saarinen, getting him on inters the same lap. Two laps later he’s surged to a podium position, and Wexler’s languishing in 9th. And then the track changes again: it only rained for one lap, and the sun’s now out again to dry out the track rapidly. With everyone still in the race clad in either inters or wets there’s no telling for sure what dry tires can do, but I figure it’s worth the risk at this point. Ah, that’s both of them run out of fuel then. And that’s a very succinct depiction of Motorsport Manager, too: rags to riches to rags to riches all within a single race. The hiring and firing components, car development and resource management all look to function as you’d want them to, but it’s the races that make this a genuinely exciting game. 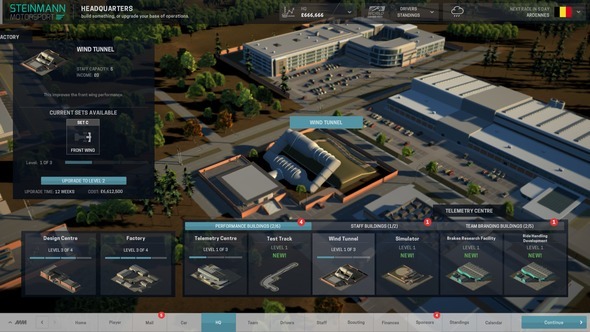 Motorsport Manager releases on PC in September 2016.